A Kindle ad for Oil of Olay. The creative looks splotchy on the Kindle's e-ink display. Why this ad shows for a 30-something male is another matter. I received my Kindle with Offers on Friday. It’s Amazon’s latest attempt to take on a somewhat new market. The name “Kindle with Offers” is a bit misleading, but it sounds better than “Kindle with Ads”. An ad for Oil of Olay. An offer for a $10 credit if you register your VISA card as the default card for Kindle purchases and buy a Kindle book from a select list. An offer for a $20 Amazon gift certificate for $10. For people used to Web ads that flash, blink and otherwise overwhelm content, the Kindle ads are barely present. One appears on a small portion of the home screen, similar to a banner ad. The other format (shown in the picture) takes over the entire lock screen of the device if you haven’t been reading for a while. The ads are disappointing. Amazon hasn’t done anything unique or interesting with them. Some of the ads on the Kindle were clearly repurposed. 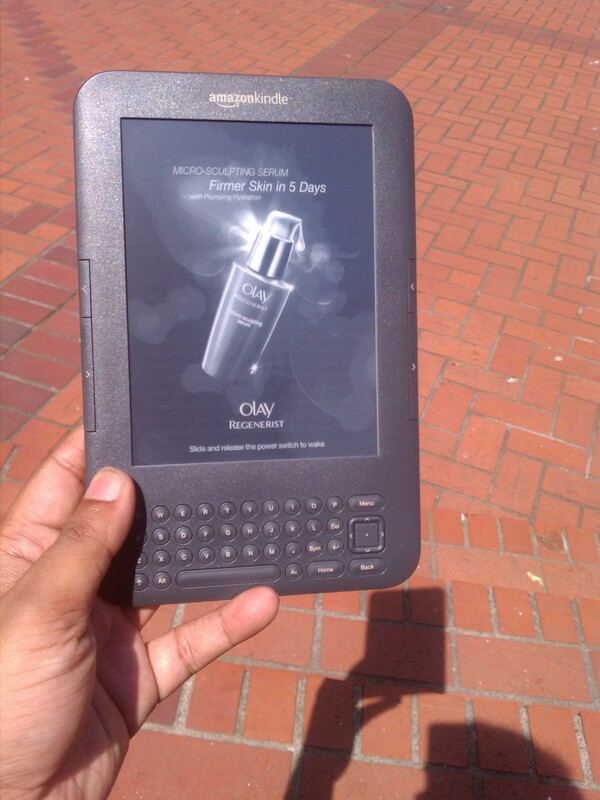 Ads for Oil of Olay makes extensive use of gradients, which look terrible on the Kindle’s e-ink display. I thought my screen had become defective until I cleared the ad. I really shouldn’t even see the Oil of Olay ad (not female) or Buick ad (not old enough). Amazon should know that neither ad provides value to me or the advertiser. The ads I see on Amazon.com are much more relevant than these. In terms of offers, VISA is trying hard to be at the forefront of mobile payments. A similar promotion ran when Starbucks launched payments on the iPhone; if you registered your VISA card and bought Starbucks credit with it, you received a $5 bonus. VISA also recently invested in Square. The $20 Amazon certificate is similar to the promotion that LivingSocial ran earlier. Except this time Amazon is footing the bill for the promotion. Acting on an offer is a bit clumsy. After selecting an offer, you get an email with all of terms and instructions on how to redeem it. Kindle with Offers is priced at $25 less than the comparable Kindle. The discount on the Amazon gift card is effectively another $10 loss. That brings the Kindle with Offers discount to $35. For comparison, Google makes less than $20 per year per user (on average) for its massive advertising engine. For a media play, Kindle will need a lot more advertisers. Or it will need an aggressive revenue share on real offers like Groupon has. Otherwise, it’s just a way to get Kindles in the hands of more price sensitive customers without repricing the base product. That itself is not a bad goal. I just got a Kindle through an offer from American Express. Sign up for their a gold card, spend $500 and they send a Kindle + $100 Amazon gift card. So far, I really like the Kindle. It is easy on the eyes and comfortable to hold. So far I loaded up on free classics. Not sure how many books I’ll actually buy – I’m cheap and used books can usually be had for under $5 on Amazon. Can’t wait for the library loaning although I’m skeptical of how easy it will be. I think Overdrive is involved and getting audiobooks with Overdrive’s iPhone app is a huge pain.